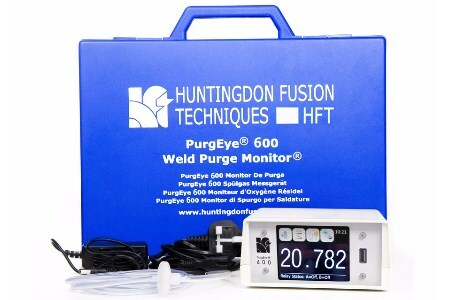 Huntingdon Fusion Techniques (HFT) has designed and developed a Weld Purge Monitor® that reads from atmospheric level of oxygen (20.94%), down to one ppm (0.0001%). The PurgEye® 600 has a life time sensor that does not require replacement or recalibration. The instrument has been designed with a large, full colour touch screen (3.2 in./81 mm) and on-screen graph displaying the oxygen levels during the welding process. Its USB data logging capability allows the operator the ease of data transfer without needing a computer connection. These stable and accurate results can be logged for each weld using HFT’s PurgeLog™ software. The monitor also includes an internal sampling pump with gas filtration, which means there is no requirement for an external hand pump. Quick fit/disconnect and leak tight fittings are manufactured as standard on the PurgEye 600. In addition, control alarms will activate in the event of rising or falling oxygen level, which can be pre-set by the user.